BUYSOUNDTRAX Records presents the soundtrack for FIRE AND ICE, featuring music composed by William Kraft (AVALANCHE, THE CHISHOLMS) for the 1983 animated fantasy adventure directed by Ralph Bakshi (FRITZ THE CAT, WIZARDS, THE LORD OF THE RINGS), featuring characters created by artist Frank Frazetta, from a script by Roy Thomas and Gerry Conway, and featuring the voices of Randy Norton, Cynthia Leake, Steve Sandor, Sean Hannon, William Ostrander and Eileen O’Neill.. Produced during the height of the sword and sorcery craze, FIRE AND ICE takes place in a prehistoric land under siege by an evil queen, Juliana, and her son, Nekron. An ever expanding wall of glacial ice created by Nekron’s dark sorcery is their greatest weapon, smashing down the defenses of their opponents in the southern lands, which is quickly followed by their invading army of subhuman men who stomp out all resistance and capture whoever is left standing. Into this conflict is thrust the young warrior, Larn, who barely survives his first encounter with the subhumans. In a neighboring kingdom ruled by the kindly king, Jarol, a sinister plot unfolds as Nekron sends envoys to distract Jarol long enough to abduct his daughter, the beautiful princess, Teegra. Not to be underestimated, Teegra is able to escape from the subhumans on the road back to Nekron and she crosses paths with Larn. As they get to know each other and their feelings grow stronger, Teegra is recaptured by the subhumans during a crucial moment where Larn is occupied by the attentions of a giant octopus. Passing out from exhaustion. Larn awakens to find himself bound. Concerned he has been recaptured by the subhumans, Larn is relieved to discover that his captor is actually the lone warrior, Darkwolf, who only bound him to prevent him from opening up his wounds. Larn agrees to an alliance with Darkwolf, who has his own personal reasons for fighting and they form an alliance, agreeing to fight together against Nekron and Juliana and rescue Teegra. But can they reach her in time to prevent whatever cruel fate Nekron has in mind for her? Can Nekron’s dark reign be ended before the land is covered with glacial ice and there are no free men left to resist? Released in the summer of 1983, FIRE AND ICE offered the audience a unique visual experience. In his earlier features, Bakshi’s animation style had been marked by reliance on a technique called rotoscoping, in which his artists would take live action footage and trace over it, frame by frame, to create drawn images which were then animated. Unlike the use of silhouetted armies marching and battling through his previous animated films, the rotoscope process was used in FIRE AND ICE as the basis for the character movements and interactions, such as fights and chases. Presaging today’s use of motion capture in CGI-animation, Bakshi and Frazetta first spent 4-6 weeks filming live actors performing with simple props on a bare sound stage. That footage was rotoscoped and then animated one frame at a time in the manner of traditional cel animation. The end result was very fluid and lifelike movement. The effectiveness of those animated images was enhanced by the atmospheric background paintings that established the environment in which the characters lived, and it was in these paintings that Bakshi tried to replicate the look of Frank Frazetta’s artwork. 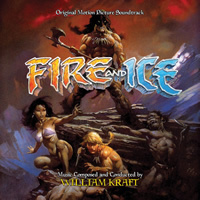 The experience of watching FIRE AND ICE is greatly enhanced by its musical score, which was Bakshi’s first collaboration with William Kraft, a composer originally from the classical world. William Kraft’s music for FIRE AND ICE is a thunderous, large scale composition, developed and orchestrated not in a Hollywood fashion but in the manner of old school classicism. His previous film scores had been necessarily atmospheric and progressive but with FIRE AND ICE, the composer enjoyed the opportunity to be highly thematic. All of the main characters have their own themes, which interact constantly throughout the score. The music for FIRE AND ICE was orchestrated by Angela Morley, a noted film composer in her own right (WATERSHIP DOWN) who also orchestrated for John Williams throughout the 1990s. FIRE AND ICE was recorded at Paramount Studios with a large size orchestra, with Dan Wallin serving as music scoring mixer, which gave Kraft’s score a generously large sonic dimension. Evoking the sorceries of ages past and the unsung heroes of fable and fantasy, the score for FIRE AND ICE is a battle between beneficent heroism and dark sorcery, sculpting the film’s brutal landscape with heavy swaths of low horns, ascending trumpets, and plenty of percussion. William Kraft (b. 1923, Chicago) has had a long and active career as composer, conductor, timpanist/percussionist and teacher. He is Professor Emeritus at the University of California, Santa Barbara, where he served for 11 years (1991 - 2002) as Chairman of the Composition Department and Corwin Professor of Music Composition. From 1981 -85, Mr. Kraft was the Los Angeles Philharmonic's Composer-in-Residence. During his residency, he was appointed by executive director Ernest Fleischmann to serve as the founding director of the orchestra's performing arm for contemporary music, the Philharmonic New Music Group. Mr. Kraft had previously been a member of the Los Angeles Philharmonic for 26 years; eight years as percussionist, and eighteen years as Principal Timpanist. For three seasons, he was also assistant conductor of the orchestra, and thereafter, frequent guest conductor. Mr. Kraft has received numerous awards and commissions, including two Kennedy Center Friedheim Awards (first prize in 1990 for Veils and Variations for Horn and Orchestra, and second prize in 1984 for Concerto for Timpani and Orchestra; two Guggenheim Fellowships; two Ford Foundation commissions; fellowships from the Huntington Hartford Foundation and the National Endowment for the Arts; the American Academy and Institute of Arts and Letters Music Award; the Norlin/MacDowell Fellowship; the Club 100 Distinguished Artist of Los Angeles Award, the ASCAP Award; the NACUSA Award; the Eva Judd O'Meara Award; first place in the Contemporary Record Society competition; commissions from the Library of Congress, U.S. Air Force Band, St. Paul Chamber Orchestra, Kronos Quartet, Voices of Change, the Schoenberg Institute, consortium of Speculum Mucicae/San Francisco Contemporary Music Players' Contemporary Music Forum, The Boston Pops Orchestra, consortium of Pacific Symphony/Spokane Symphony/Tucson Symphony, the Los Angeles Philharmonic, among others. His works have been performed by the New York Philharmonic, Boston Symphony, Chicago and Philadelphia Orchestras, the Los Angeles Philharmonic, and other major American orchestras as well as in Europe, Japan, Korea, China, Australia and Israel. Recently completed recording projects are with the Czech Philharmonic, New England Conservatory and the Royal Liverpool Philharmonic. BUYSOUNDTRAX Records presents the worldwide soundtrack release of FIRE AND ICE in time for the 30th anniversary of the film’s release, featuring music composed and conducted by William Kraft. FIRE AND ICE was produced using the master elements in the composer’s archive, mastered by James Nelson of Digital Outland featuring liner notes by author Randall Larson, including new comments from the composer on the creation of this fantastic score. FIRE AND ICE is a limited edition release of 2000 units. The first 100 copies purchased directly from BUYSOUNDTRAX.COM will be autographed by the composer, William Kraft.